École de Technologie Supérieure, University of Québec, Montréal, Canada. Received August 26th, 2011; revised September 30th, 2011; accepted November 9th, 2011.
of user stories to accumulate the information that is mandatory for achieving ISO 9001 certification. other sectors as well, including health care and software. terms of product quality and customer satisfaction. effectively by the organizations studied. software artifacts back to the customer requirements. tions, are not supported by XP. plies with ISO 9001 requirements. 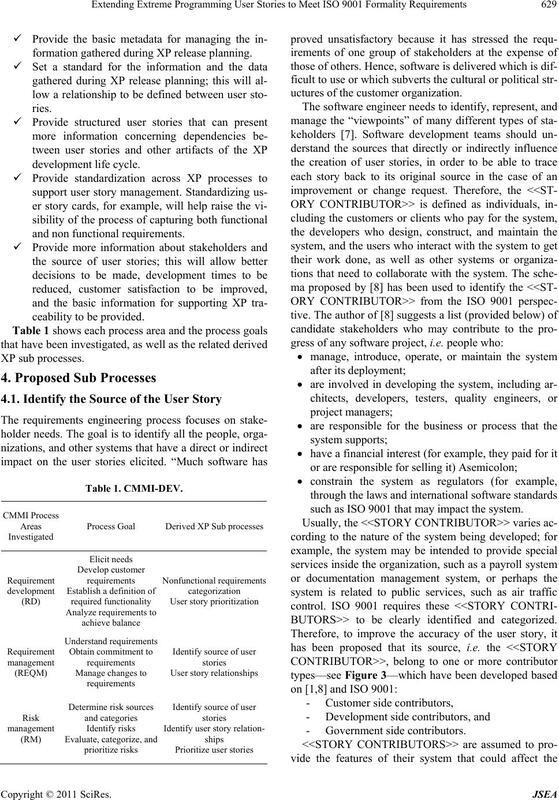 requirements throughout the earliest phases of XP (i.e. 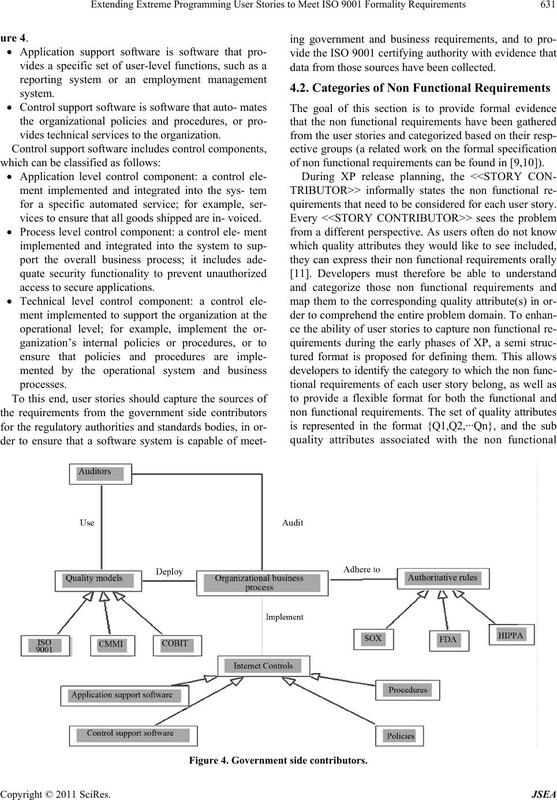 nefits of this work from the ISO 9001 viewpoint. be used in this paper. processes (e.g. processes for providing a service to users). point and to specify a feature from the system viewpoint. 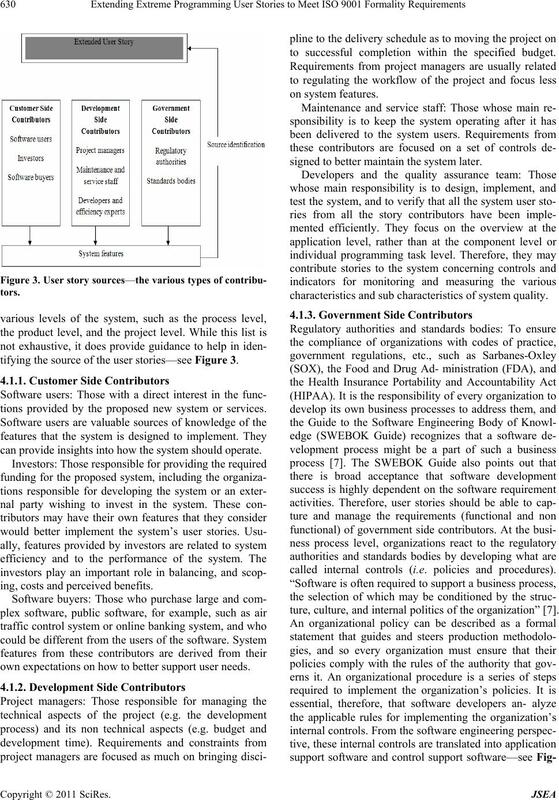 system function, such as a “user administration system”. system from the XP perspective. 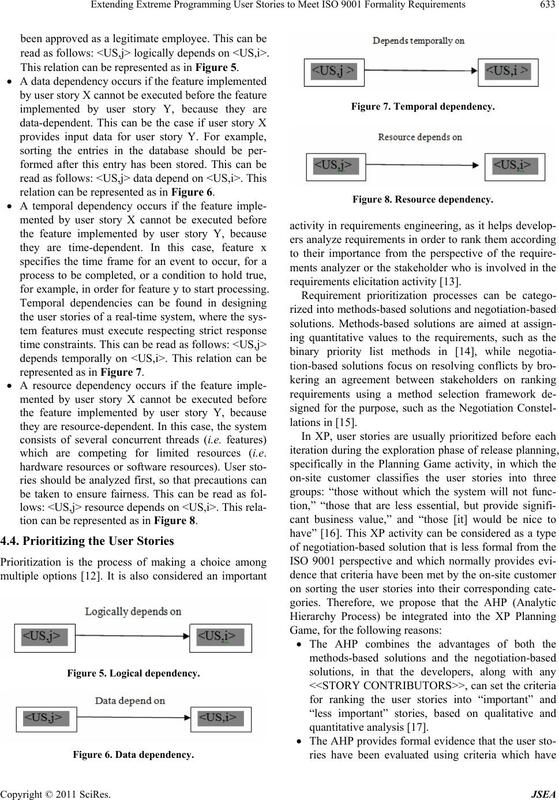 tion phase of XP release planning—see Figure 2. Figure 1. 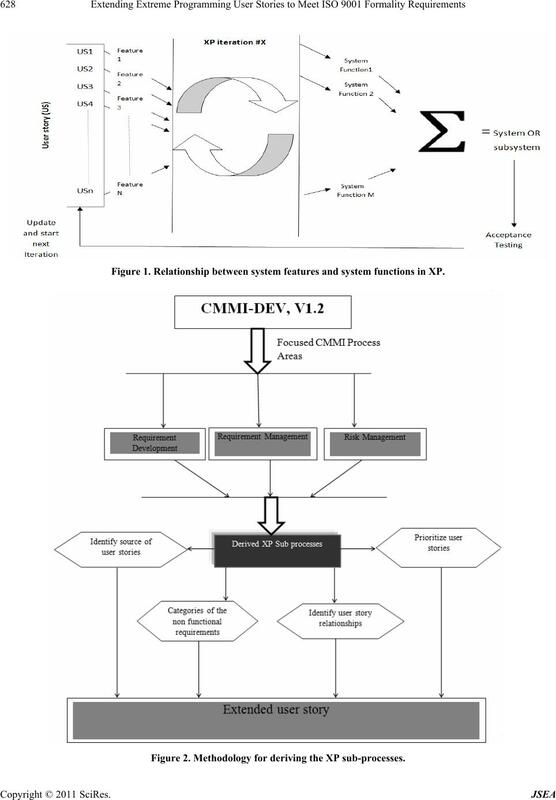 Relationship between system features and system functions in XP. Figure 2. 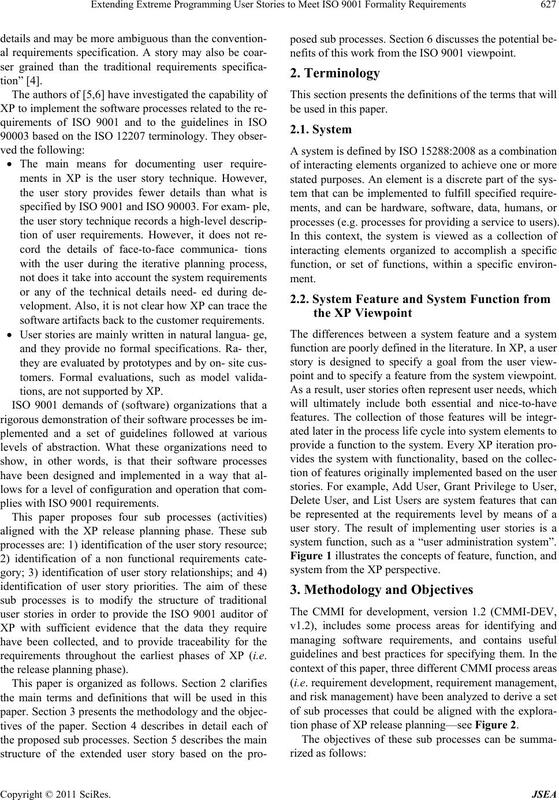 Methodology for deriving the XP sub-processes. formation gathered during XP release planning. uctures of the customer organization. such as ISO 9001 that may impact the system. BUTORS>> to be clearly identified and categorized. tifying the source of the user stories—see Figure 3.
tions provided by the proposed new system or services. can provide insights into how the system should operate. ing, costs and perceived benefits. own expectations on how to better support user needs. to successful completion within the specified budget. signed to better maintain the system later. 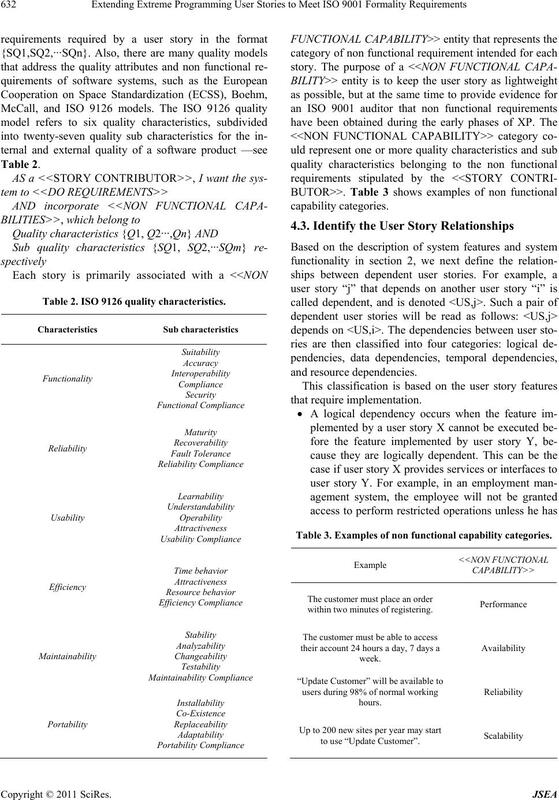 characteristics and sub characteristics of system quality. called internal controls (i.e. policies and procedures). ture, culture, and internal politics of the organization” . vides technical services to the organization. vices to ensure that all goods shipped are in- voiced. data from those sources have been collected. of non functional requirements can be found in [9,10]). quirements that need to be considered for each user story. Figure 4. Government side contri butors. Table 2. ISO 9126 quality characteristics. Table 3. Examples of non functional capability categories. read as follows: <US,j> logically depends on <US,i>. This relation can be represented as in Figure 5.
relation can be represented as in Figure 6.
for example, in order for feature y to start processing. represented as in Figure 7.
which are competing for limited resources (i.e. tion can be represented as in Figure 8. Figure 8. Resource de pendency. natives (such as time, costs, risks, etc.). 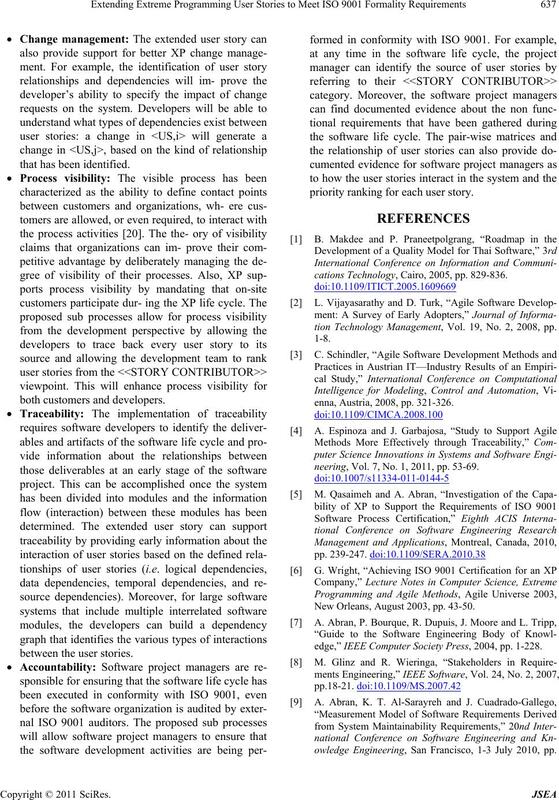 stories in XP using the AHP method. to become input for AHP prioritization. ing as a hierarchical structure, as shown in Figure 10. Figure 10. 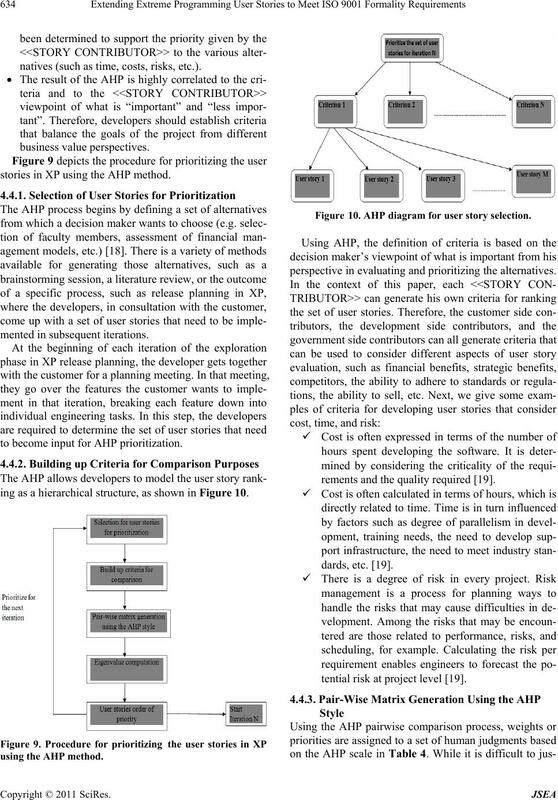 AHP diagram for user story selection. perspective in evaluating and prioritizing the alternatives. rements and the quality required . tential risk at project level . cording to the scale in Table 4.
in Tables 6, 7 and 8. Table 5. Pairwise matrix for the selected criteria. Table 6. Pairwise matrix for the cost criterion. Table 7. Pairwise matrix for the time criterion. Table 8. 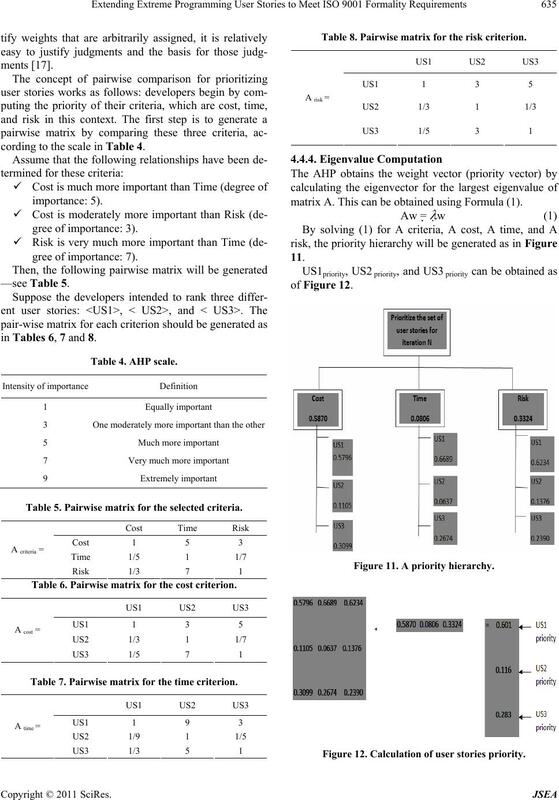 Pairwise matrix for the risk criterion. matrix A. This can be obtained using Formula (1). Figure 11. A priority hierarchy. Figure 12. Calculation of user stories priority. 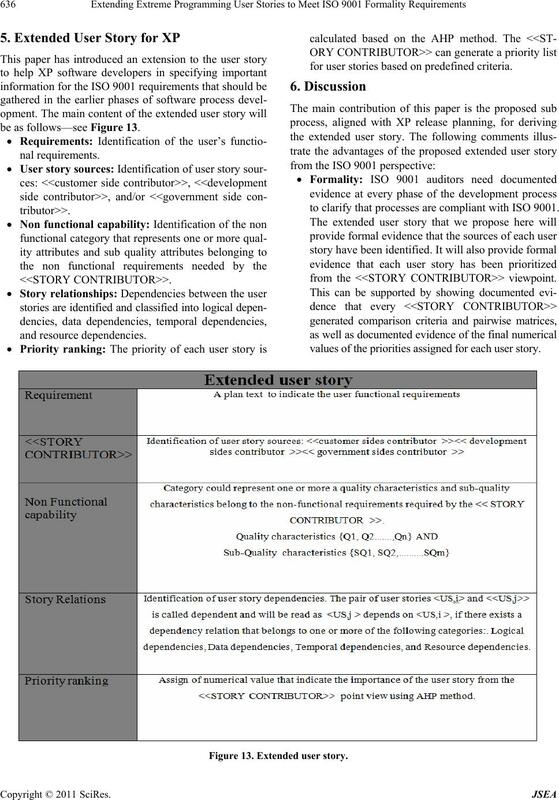 be as follows—see Figure 13.
for user stories based on predefined criteria. 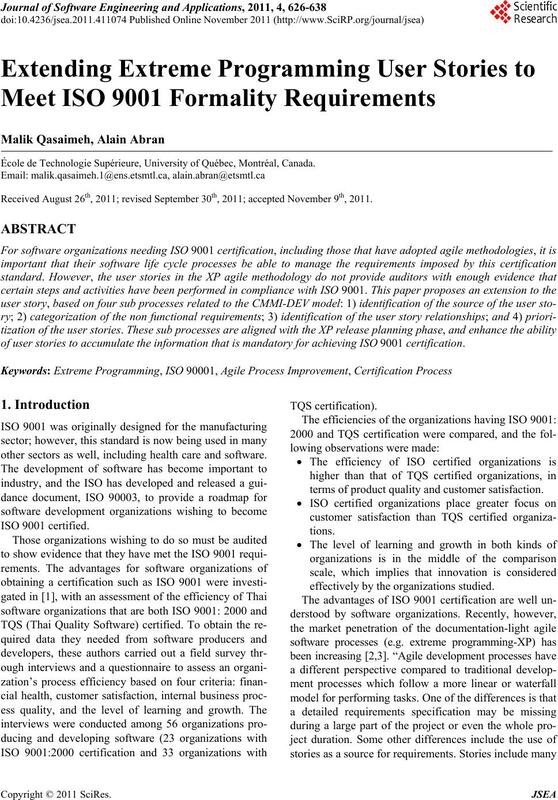 to clarify that processes are compliant with ISO 9001.
from the <<STORY CONTRIBUTOR>> viewpoint. values of the priorities assigned for each user story. Figure 13. Extended user story. priority ranking for each user story. cations Technology, Cairo, 2005, pp. 829-836.
tion Technology Management, Vol. 19, No. 2, 2008, pp. enna, Austria, 2008, pp. 321-326.
neering, Vol. 7, No. 1, 2011, pp. 53-69. New Orleans, August 2003, pp. 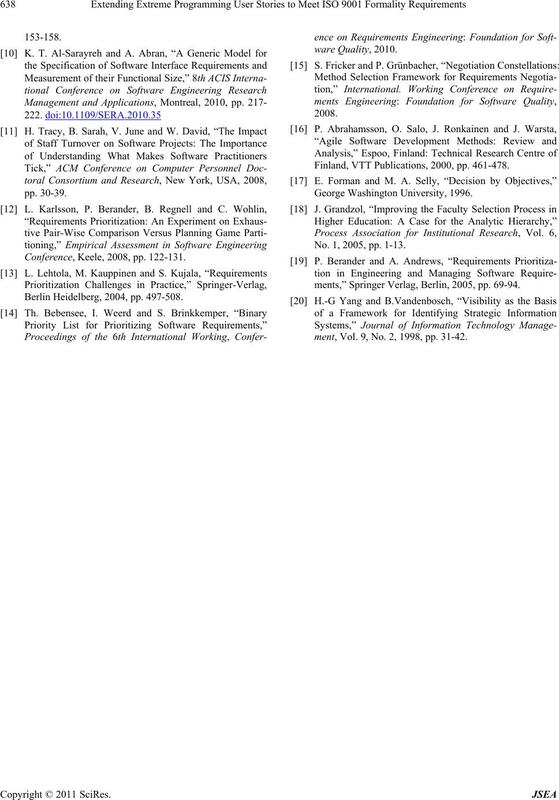 43-50.
edge,” IEEE Computer Society Press, 2004, pp. 1-228.
owledge Engineering, San Francisco, 1-3 July 2010, pp. Conference, Keele, 2008, pp. 122-131. Berlin Heidelberg, 2004, pp. 497-508. Finland, VTT Publications, 2000, pp. 461-478. No. 1, 2005, pp. 1-13.
ments,” Springer Verlag, Berlin, 2005, pp. 69-94.
ment, Vol. 9, No. 2, 1998, pp. 31-42.